Tailored to the European market, hull two of the brand new Horizon FD85 model has been completed and will make its highly anticipated European debut at the 2017 Cannes Yachting Festival, September 12-17, 2017. Developed in collaboration between world-renowned yacht designer Cor D. Rover and Horizon’s in-house naval architecture team, this 85’ advanced fast displacement motoryacht features superior cruising capabilities that complement living and entertaining spaces comparable to 100-foot-plus megayachts. 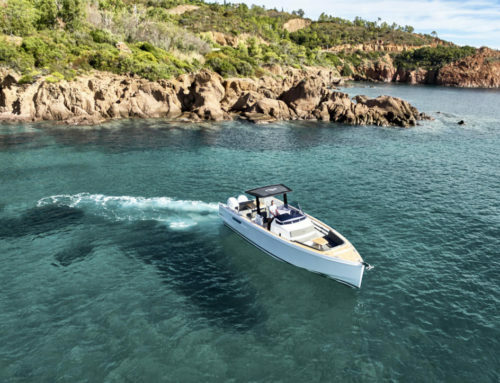 Immediately striking in appearance thanks to its thoughtful exterior styling, the new European FD85 incorporates an advanced hull form dubbed the High Performance Piercing Bow (HPPB). 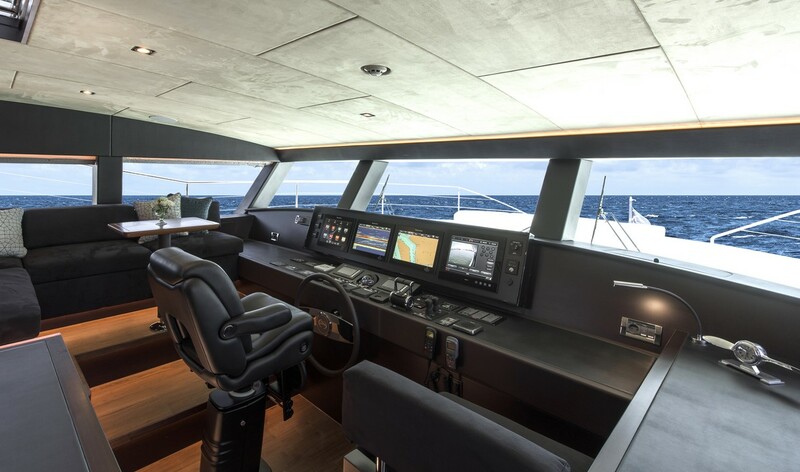 The HPPB design allows for excellent seakeeping at both slow and high speeds and, when augmented by the yacht’s stabilization system, affords a sublimely comfortable cruising experience. 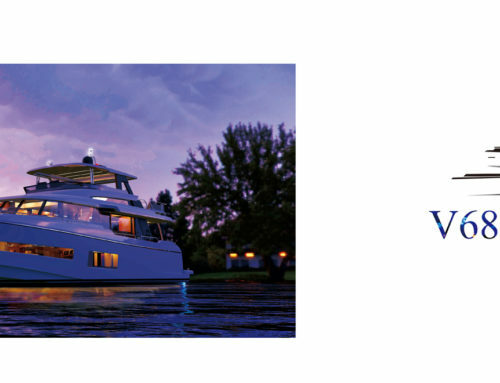 With its uniquely styled exterior and innovative interior layout designed to maximize the FD85’s expansive volume and 23’3” beam, this yacht has been purposely designed to offer a variety of areas for entertainment and relaxation. Reminiscent of a villa on the sea, the main salon is highlighted by large sections of floor-to-ceiling windows, which immediately convey a sense of being at one with the outdoors while bringing in natural light and panoramic views. Designed to maximize the views and natural light afforded by the exterior styling, the master stateroom features extra-wide windows and a skylight for even more light, while four additional staterooms below continue the bright and airy feel. Creative use of space is a major theme of the Horizon FD85, and hull two features an open bridge designed to maximize outdoor entertainment. This area includes a hardtop roof with a retractable sunroof, a helm station, L-shaped settee, BBQ grill and a wet bar with four bar stools. A Jacuzzi tub (More) and 46” lift-up television invite guests to relax and enjoy the view in a space that can be easily shaded with a sun awning. On the main deck, an abundance of aft deck space, great visibility, and an inviting seating area for 10-12 people greet guests who board the Horizon FD85. The European version of the Horizon FD85 motoryacht is equipped with twin MAN 1200hp engines and a fuel capacity of 3,480 gallons. Her top speed is estimated at 16.5 knots and she offers a 1,262nm range at an 11-knot cruise. 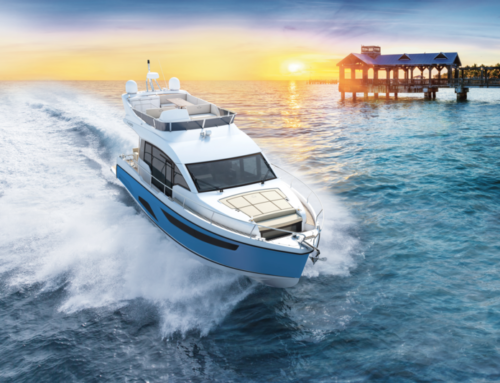 Stabilizers, a hi-lo swim platform, gangway and a full complement of standard equipment to ensure safe cruising further enhance the overall yachting experience aboard this new FD85. 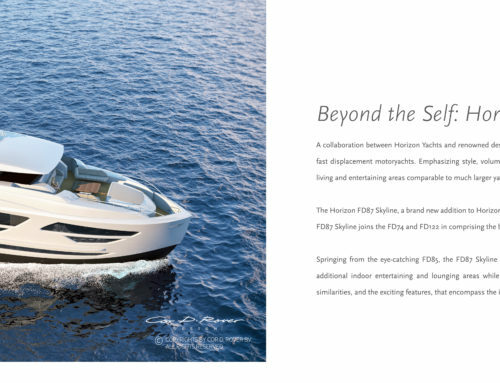 Unique and intentional in design, the multi-functional and user-friendly aspects of the Horizon FD85 fast displacement motoryacht ensure she is a performance yacht as well as a playground for owners to enjoy a variety of lifestyles. 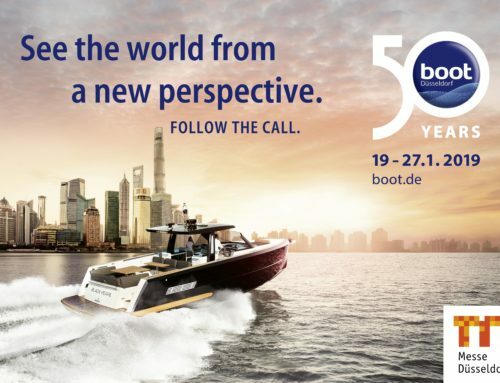 The brand new hull two of the FD85 will make her debut at Cannes Yachting Festival September 12th-17th, at the Horizon Yachts stand: SYE222 on land and SYE035 in water. The Cannes Yachting Festival is the Europe’s leading in-water boating event, which takes place every September in the elegant and luxurious surroundings of the sparkling bay of Cannes, France.